Success in small molecule screening relies heavily on the preselection of compounds. Here, we present a strategy for the enrichment of chemical libraries with potentially bioactive compounds integrating the collected knowledge of medicinal chemistry. Employing a genetic algorithm, substructures typically occurring in bioactive compounds were identified using the World Drug Index. Availability of compounds containing the selected substructures was analysed in vendor libraries, and the substructure-specific sublibraries were assembled. Compounds containing reactive, undesired functional groups were omitted. Using a diversity filter for both physico-chemical properties and the substructure composition, the compounds of all the sublibraries were ranked. Accordingly, a screening collection of 16,671 compounds was selected. 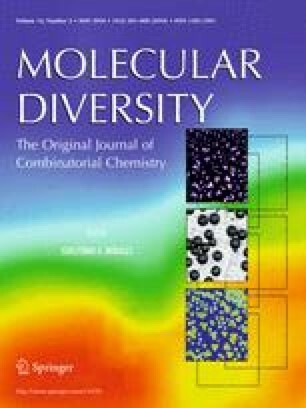 Diversity and chemical space coverage of the collection indicate that it is highly diverse and well-placed in the chemical space spanned by bioactive compounds. Furthermore, secondary assay-validated hits presented in this study show the practical relevance of our library design strategy. The online version of this article (doi: 10.1007/s11030-009-9187-z) contains supplementary material, which is available to authorized users. We thank Hans-Dieter Höltje and Victoria Higman for critical reading of the manuscript. The screening data were provided by Jörn Saupe, Samuel Beligny, Svantje Behnken and Susann Matthes. Three institutes, namely the Helmholtz Centre for Infection Research (HZI), the Max Delbrück Centrum (MDC), and the Leibniz Institut für Molekulare Pharmakologie (FMP) co-financed the described screening library, which is now ready to use for supporting screening projects. Extensions to this library are currently made by the MPI in Dortmund, the University of Oslo and the University of Konstanz.